This beautiful designer platinum band is made with the finest materials known to man. Five genuine round cut diamonds, all color G-H, build in size toward the center with a 1/2 total carat weight. 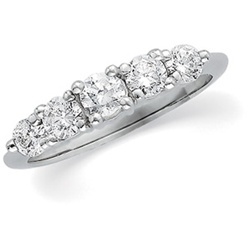 Classy and timeless, this platinum wedding band is perfect to show your love and affection.